Long gone are the days when all the neighborhood children would gather outside to invent new games to play in the park. Now, kidsget home from school and burrow inside to play video games, browse the Internet or watch re-runs on television. Aside from the more obvious physical and social ramifications of this, one could argue that these children may have a harder time relating to environmental issues later in life because they aren’t experiencing nature today. One recent research project found that only one in five children in the UK are “connected to nature.” The research, conducted by The Royal Society for the Protection of Birds (RSPB), found that only 21 percent of the 8-to-12-year-olds who participated had a realistic and achievable connection with wildlife and nature, according to BBC’s report on this by Matt McGrath. “Nature is in trouble, and children’s connection to nature is closely linked to this. The recent State of Nature report shows that nature in the UK is being lost at a dramatic rate. We can all take action to put nature back into childhood, to ensure young people have better lives and a better future,” said RSPB Chief Executive Dr. Mike Clarke on the organization’s website. 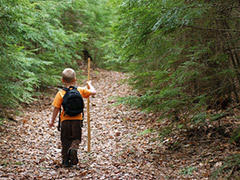 Identifying and measuring how much “connection to nature” our children have or don’t have hasn’t been done before to this degree, and, no doubt, there may be some disagreements about what the ideal connection level should be. However, putting that aside, the results are worth considering. Think about it. How badly will our children want to preserve parks, forests, lakes and rivers if they don’t play in them now? Will they want to save endangered species of plants or animals that they’ve never heard of or even seen? Chances are that if children haven’t experienced nature, been given the chance to form an emotional connection, or even a small, pleasant memory with the outdoors, they may be less inclined to care about those things later in life. Posted on October 29th under Global Ecology.